Rhubarb Yogurt Parfait, Thyme for Cooking healthy spring dessert. Rhubarb sauce is simple: rhubarb and sugar. I like tart; if you prefer sweet add a bit more sugar. The sauce will keep about a week in the fridge so double or triple the recipe if you like. Wash the rhubarb and slice it about 1/4" (.5cm) thick. No need to peel but pull off any stringy bits as you slice. Use a sharp knife. Put in a saucepan with the water and sugar. Cover and cook over medium heat until very soft. Taste and add more sugar if you like - before removing from heat. 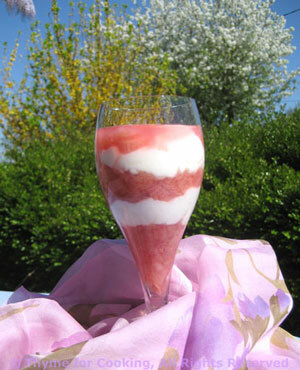 In a parfait or champagne flute, or other glass, layer the rhubarb sauce and yogurt. Serve.